check Mainly for access purposes. The simplified variant of our retractable ladders. 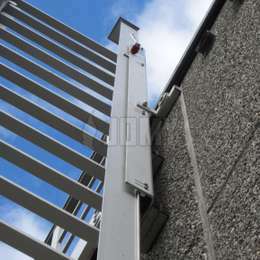 Engineered to our highest standards by our own design bureau first in the 70s, the lightweight 100% anodized aluminium Mini-JOMY Ladder can widthstand a total charge of up to 2,500 Kg (35 average weight adults)! 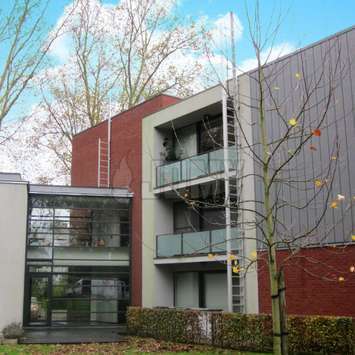 Compact but robust! 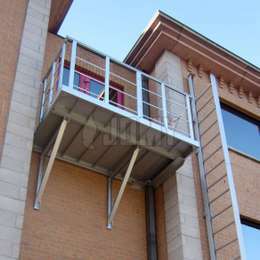 It may lack the reassuring guardrail, height possibilities and multiple independent opening handles of its big brother the JOMY Ladder, but it is still well suited for fire evacuation of small homes and offices consisting of no more than 2 storeys. 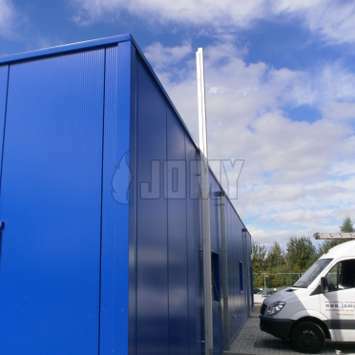 Its solid construction, simplicity and weatherproof box-section design make it very popular for accessing heights in industrial environments where space-saving is often mandatory. 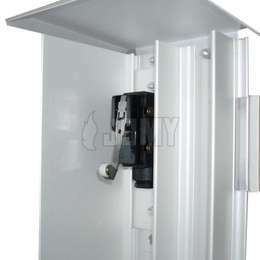 The Mini-JOMY Ladder can be protected against unauthorized use simply by placing a lock on the bottom opening latch. Evacuation from 2 storey building (one opening latch). 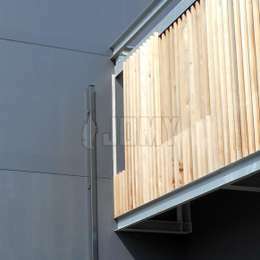 Maximum height Up to 15 m or 50 ft. Opening mechanism 1 or maximum 2 simple opening latches. 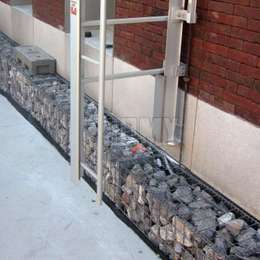 Permitted charges Rungs: 770 lb or 350 Kg. Ladder total: 5500 lb or 2,500 Kg. 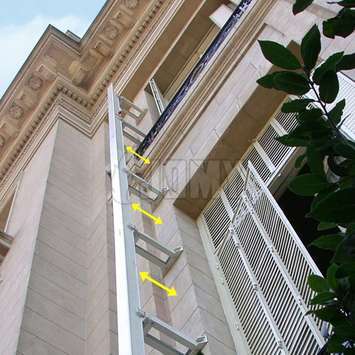 Attachments Standard, one attachment every 3’3” ft or 1 m.
Based on popular needs and to help you choose the one that fits you the most, we have gathered hereunder the most common configurations of the Mini-JOMY Ladder .